Without question, one of my oldest and most treasured possessions is my 1985 Jeep CJ7 which has 251,867 miles on the odometer. Other than the 500 miles that were put there early on by my wife when she was looking to keep up on her manual transmission skills, I put every klick on that bad boy. The places my CJ and I have been, and the stories we could spin, would sustain many seasons of a Jeep Reality Show. I take it pretty easy on the CJ these days; it deserves that, being that in all our years together it has never once left me stranded anywhere. I've always been able to hose clamp, duct tape and bubblegum things together enough to roll home. People smirk at the "it's a Jeep thing" mantra, but I'm firmly convinced that my Jeep has an automotive soul that appreciates my regular maintenance as much as I respect it steadfastness. Keeping the air filter clean on the CJ is a must, especially if you tend to run it off-road looking for ideal mountain biking locals. A few years ago I put a K&N E-1080 air filter in my Jeep and I could immediately feel it breathing better. When you spend that many miles in the same car you can even feel when a tire loses a few PSI. I like keeping my Jeep happy and cleaning my air filter has become perhaps my favorite maintenance procedure, simply because of the huge return I get for such a simple task. With a K&N Recharger® Kit 99-5050 or 99-5000, the most time consuming part of cleaning the filter is also the most effortless. I'll get back to that in a minute. Two wing nuts securing the air filter housing cover is all that separates me from getting to the filter element. 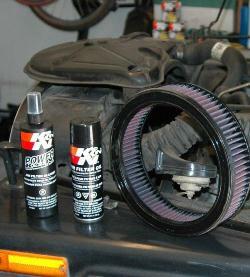 In less than a minute I'm holding the air filter and applying K&N PowerKleen® industrial strength degreaser and air filter cleaner. I let the cleaner soak for about 10 minutes on the air filter so that it can thoroughly loosen the dirt and road grime and then I gently rinse it with a hose until the water runs clean. When all of the dirt has been washed out, I know I've cleaned it correctly. If I still see dark patches of red or more dirt after rinsing, I simply spray on more PowerKleen and repeat the procedure until the filter media is clean. Next, it is time to let the filter element completely dry before spraying on the air filter oil. On average that only takes 1-2 hours depending on how warm it is outside. Once the filter is thoroughly dry, I simply spray on the air filter oil slowly and evenly along the peak of each filter pleat, and then let it sit for 10 to 20 minutes or so. The oil's distinctive red color makes it easy to tell if filter is uniformly covered, if there are still spotty areas after allowing the oil to wick, I just spray on a little more oil, and viola, I'm ready to roll. 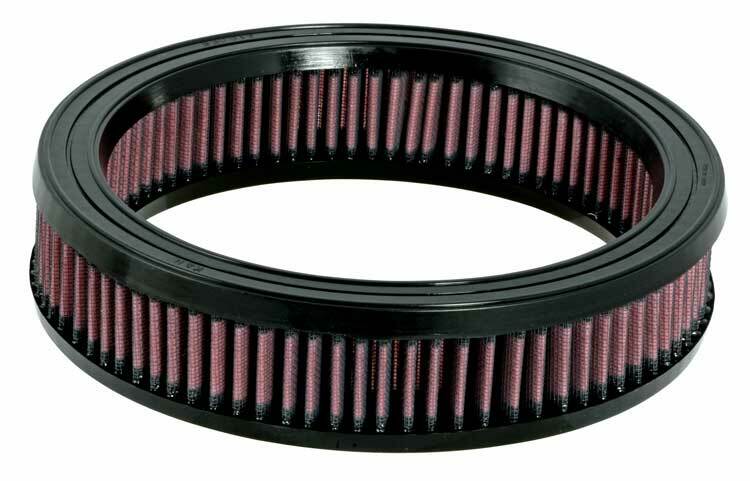 Most K&N air filters can perform up to 50,000 miles between cleaning depending on driving conditions, some more some less. With the way I pamper my jeep, this could be a very long time. 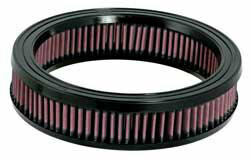 See all K&N air filters for 1972 through 1987 Jeep CJ7 models at the Jeep CJ7 Air Filters page on KNFilters.com. Find K&N products for just about any vehicle using the K&N application search then use the K&N dealer search to find a K&N dealer in your part of the world. 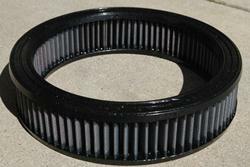 Check out pictures of what a dirty air filter looks like, air filter cleaning videos, and other K&N air filter cleaning products available on the K&N website.